To whom ever receives this letter. I am Private Adush of the Expansionary Defense Fleet unit B36. Our recent mission to Corellia has been a failure, we were sieged by Mandalorian vessels a short ways off from CZ-220 and I have been stranded there, Captain Gruont died a few hours after our arrival. The cargo my ship was carrying remains with me safely on this colony planet. Having found at least two other Chiss here including an executive Engineer named Eamuna here, perhaps our original trade plans could be considered here instead? Permission sought and if approved, seeking materials and funding to begin procedure 1542 of the production code. Some time later you are met by a courier from Csilla who passes you a small envelope. Inside the envelope is a chip, which when placed into your holopad, plays a message. 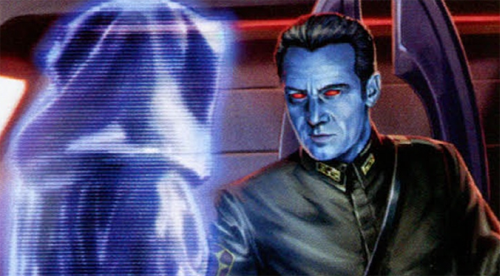 The message begins with a close-up on what looks to be a middle-aged Chiss official with pale skin and jet black hair, wearing clothes decorated in medals. He leans in and checks the light to see if it is recording, and then offers a single nod to the camera. "Right. File… One-four, three eight seven slash CW. You seem to have contacted us concerning an unauthorized trade route change. Luckily for you the one responsible for it is dead, whether or not that is your doing is yet to be determined. A trial run and audit of your assets is in order. Doubly lucky, we’ve no trade routes that far out, and if you can navigate the hyperspace lanes back to Csilla with your cargo, this may prove an opportunity for you. Should you perform well the audit is sure to go well. The lot of you are to decide on the one most capable of being acting Captain of what we have labelled file one-four-three-eight-seven-slash-mtr, or more casually, the Mytaranor Trade Run." The man furrows his brows and leans in to the camera, speaking sternly. With a finality about him, he smacks the console and the transmission ends. Yes General Sorne a military salute We have already made some progress sir, having secured a investor in our current project labelled under file one-four-three-eight-seven-slash-mtr. We have secured through the investor a piece of land, a docking bay, a workshop, two drills and a private residence for me and my Chief Engineer Hriste. The Engineer has the original blueprints as found under file one-four-three-eight-seven-slash-mtr and is working on them at present to figure out how to best begin production.